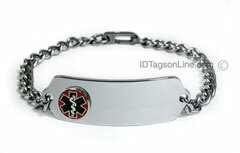 DNR Classic Stainless Steel ID Bracelet with Blue emblem. 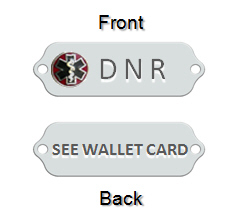 DNR Classic Medical ID Bracelet with raised emblem. Medical ID Bracelet, DNRIDB20 (size 1-3/4" x 1/2"), is made from .062" thick premium Stainless Steel and is hand polished to the mirror finish. The enameled medical logos, which are attached to the plate, come in either red, blue or pink colors. The bracelet tag is slightly curved for wrist wear.